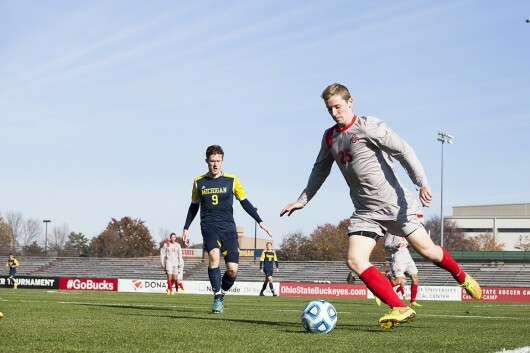 Then-sophomore defender Austin Bergstrom (25) kicks the ball during a game against Michigan in the first round of the Big Ten Tournament on Nov. 9 at Jesse Owens Memorial Stadium. OSU won, 1-0. Coming off a three-week road swing, the Ohio State men’s soccer team will prepare to host its first conference game this weekend. After playing to a 3-3 double-overtime draw against in-state rival No.11 Akron on Wednesday, the Buckeyes are scheduled to take on another ranked opponent in No. 13 Penn State at 3 p.m. on Sunday at Jesse Owens Memorial Stadium. Before its game against Akron, OSU was on a four-game losing streak, trying to find its momentum. Despite the team’s disappointing start to the season, it did not let it affect its mindset going into Wednesday’s game as the Buckeyes came from behind to tie the game against Akron. OSU proved to be able to keep up with a ranked competitor, but the Buckeyes will face another heavy challenge as they prepare to face No.13 Penn State. Mason said that the team would really have to take its chances this weekend because it is going to be a 90-minute battle. Despite the challenge OSU will likely face, Doyle said the team would like the fans to come out and support the team on Sunday. Penn State comes into Sunday’s game after defeating 10th-ranked Indiana 1-0 on Sunday in University Park, Pennsylvania. Penn State stands at 4-1-1 overall and 1-0-0 in Big Ten play. Freshman forward Marc Curran leads the team with six goals, while senior midfielder Brian James has three goals and one assist. Senior goalkeeper Matt Bersano is 4-1-1 overall with a 0.48 goals against average and .880 save percentage and has played a total of 470 minutes. Following Sunday’s action, the Buckeyes are scheduled to take on Dayton at 7 p.m. on Friday at Jesse Owens Memorial Stadium.